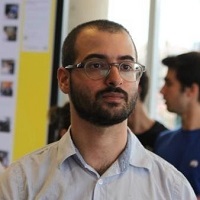 Saleem Dabbous is the co-founder and studio director of KO_OP, an artist run and owned game studio. He runs the business at KO_OP and acts as producer on most of the studio's projects. At KO_OP Saleem founded KOLAB, a grant given to upcoming game makers to create small games that no one else would fund. He was also a co-organizer of the Mount Royal Game Society, a not-for-profit organization that aims to provide a base of support for independent and aspiring Montreal-area game developers.